Posted by admin in activity reports, Alaska, Caribbean, Chile, Cleveland, Colombia, Ecuador, Etna, Fuego, Guatemala, Hawaii, Iliamna, Indonesia, Italy, Kamchatka, Karymsky, Kilauea, Lewotobi, Mexico, Nevado del Ruiz, Popocatépetl, Puyehue, Russia, Shiveluch, Soufrière Hills, Sundoro, Tengger Caldera, Tungurahua, United States, Weekly Volcanic Activity Reports. Click on the map for a larger version (1211 x 784 pixels). 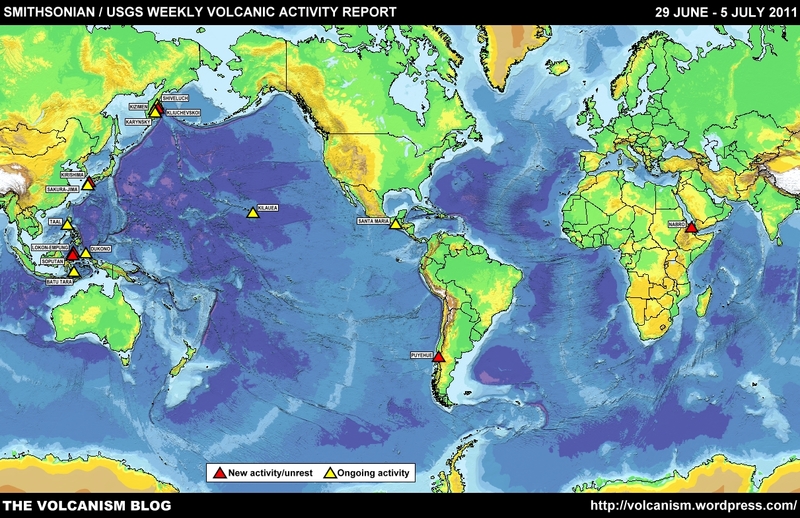 The Smithsonian Institution/United States Geological Survey Weekly Volcanic Activity Report for 28 March to 3 April 2012 is now available on the Global Volcanism Program website. The following is a summary and not a substitute for the full report. 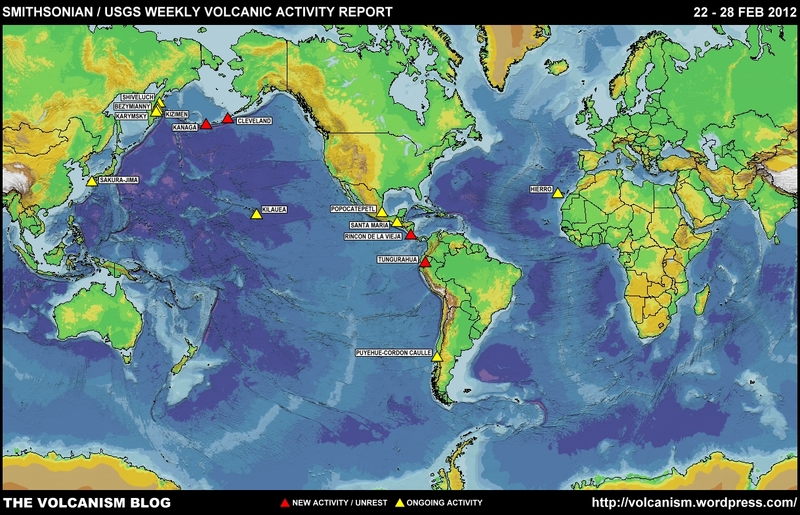 The current report: Weekly Volcanic Activity Report. Previous reports: Weekly Reports Archive. The SI/USGS map of volcanoes discussed this week. New activity/unrest: Cleveland (Alaska, USA), Fuego (Guatemala), Iliamna (Alaska, USA), Lewotobi (Indonesia), Nevado del Ruiz (Colombia), Soufrière Hills (Montserrat), Sundoro (Indonesia). Ongoing activity: Etna (Italy), Karymsky (Russia), Kilauea (Hawaii, USA), Popocatépetl (Mexico), Puyehue-Cordón Caulle (Chile), Shiveluch (Russia), Tengger Caldera (Indonesia), Tungurahua (Ecuador). Note: ‘a.s.l.’ = ‘above sea level’. Posted by admin in activity reports, Caribbean, Chile, Cleveland, Colombia, Ecuador, Etna, Hawaii, Iliamna, Italy, Japan, Kamchatka, Karymsky, Kilauea, Kizimen, Mexico, Nevado del Ruiz, Popocatépetl, Puyehue, Russia, Sakura-jima, Shishaldin, Soufrière Hills, Tungurahua, United States, Villarrica, Weekly Volcanic Activity Reports. The Smithsonian Institution/United States Geological Survey Weekly Volcanic Activity Report for 14-20 March 2012 is now available on the Global Volcanism Program website. The following is a summary and not a substitute for the full report. New activity/unrest: Iliamna (Alaska, USA), Nevado del Ruiz (Colombia). Ongoing activity: Cleveland (Alaska, USA), Etna (Italy), Karymsky (Russia), Kilauea (Hawaii, USA), Kizimen (Russia), Popocatépetl (Mexico, Puyehue-Cordón Caulle (Chile), Sakura-jima (Japan), Shiveluch (Russia), Soufrière Hills (Montserrat), Tungurahua (Ecuador), Villarrica (Chile). Posted by admin in Kilauea, media, volcano culture. The BBC likes to do big-budget live TV specials from time to time: they are of course very expensive and complicated, so the corporation has to choose its favoured subjects very carefully. Recently we’ve had natural history (Springwatch), astronomy (Stargazing), and little baby lambs (Lambing Live). The next big live BBC TV subject is a really big one: volcanoes. ‘BBC Two have decided to expand their unique broadcasting technique of commissioning live events with a Volcano Live series’ claims a remarkably illiterate and typo-ridden report at imediamonkey, making it seem that the BBC is actually going to go out there and commission a volcanic eruption. In fact BBC Two is taking the more sensible course of setting up the programme around a volcano that is already erupting, and which erupts in a reasonably predictable and safe way: Hawaii’s Kilauea. The series will be broadcast in four parts from 9 to 12 July and will combine live reports from Kilauea with segments looking at the phenomenon of volcanism and exploring volcanoes around the world. Professor Iain Stewart (British television’s Mr Geology) and Kate Humble (British television’s Ms Natural History) will do the presenting. According to BBC Two controller Jane Hadlow, ‘Volcano Live will offer BBC Two viewers a rare opportunity to join world-class experts at the forefront of cutting-edge volcanology research. Broadcasting live from the edge of one of the world’s most active volcanoes over four days will offer a completely new and unique way of experiencing this powerful and unpredictable natural phenomenon’. This is a high-profile project by the BBC which, if it puts the science in the foreground, has the potential to do a great deal for the public understanding of volcanoes and volcanology. Let’s hope it fulfils that potential. Let’s also hope that Kilauea doesn’t decide to end its current long-running eruption before the cameras arrive in July. That would be annoying. Posted by admin in activity reports, Alaska, Bezymianny, Chile, Cleveland, Colombia, eruptions, Hawaii, Ijen, Iliamna, Indonesia, Japan, Kamchatka, Karymsky, Kilauea, Kizimen, Lamongan, Marapi, Nevado del Ruiz, Puyehue, Russia, Sakura-jima, Santa María, Shiveluch, Tungurahua, United States, Villarrica, Weekly Volcanic Activity Reports. The Smithsonian Institution/United States Geological Survey Weekly Volcanic Activity Report for 7-13 March 2012 is now available on the Global Volcanism Program website. The following is a summary and not a substitute for the full report. New activity/unrest: Bezymianny (Russia), Cleveland (Alaska, USA), Ijen (Indonesia), Iliamna (Alaska, USA), Lamongan (Indonesia), Marapi (Indonesia), Nevado del Ruiz (Colombia), Tungurahua (Ecuador). Ongoing activity: Karymsky (Russia), Kilauea (Hawaii, USA), Kizimen (Russia), Puyehue-Cordón Caulle (Chile), Sakura-jima (Japan), Santa María (Guatemala), Shiveluch (Russia), Villarrica (Chile). Posted by admin in activity reports, Alaska, Bagana, Bezymianny, Canary Islands, Chile, Cleveland, Ecuador, eruptions, Etna, Fuego, Guatemala, Hawaii, Hierro, Italy, Japan, Kamchatka, Kanaga, Karymsky, Kilauea, Kizimen, Mexico, Papua New Guinea, Popocatépetl, Puyehue, Russia, Sakura-jima, Santa María, Shiveluch, Spain, Suwanose-jima, Tungurahua, United States, Weekly Volcanic Activity Reports. The Smithsonian Institution/United States Geological Survey Weekly Volcanic Activity Report for 29 February – 6 March 2012 is now available on the Global Volcanism Program website. The following is a summary and not a substitute for the full report. New activity/unrest: Bezymianny (Russia), Cleveland (Alaska, USA), Etna (Italy), Kanaga (Alaska, USA), Tungurahua (Ecuador). Ongoing activity: Bagana (Papua New Guinea), Fuego (Guatemala), Hierro (Canary Islands), Karymsky (Russia), Kilauea (Hawaii, USA), Kizimen (Russia), Popocatépetl (Mexico), Puyehue-Cordón Caulle (Chile), Sakura-jima (Japan), Santa María (Guatemala), Shiveluch (Russia), Suwanose-jima (Japan). Posted by admin in activity reports, Alaska, Bezymianny, Canary Islands, Chile, Cleveland, Costa Rica, Ecuador, eruptions, Guatemala, Hawaii, Hierro, Japan, Kamchatka, Kanaga, Karymsky, Kilauea, Kizimen, Mexico, Popocatépetl, Puyehue, Russia, Sakura-jima, Santa María, Shiveluch, Spain, Tungurahua, United States, Weekly Volcanic Activity Reports. The Smithsonian Institution/United States Geological Survey Weekly Volcanic Activity Report for 22-28 February 2012 is now available on the Global Volcanism Program website. The following is a summary and not a substitute for the full report. New activity/unrest: Cleveland (Alaska, USA), Kanaga (Alaska, USA), Rincón de la Vieja (Costa Rica), Tungurahua (Ecuador). Ongoing activity: Bezymianny (Russia), Hierro (Canary Islands), Karymsky (Russia), Kilauea (Hawaii, USA), Kizimen (Russia), Popocatépetl (Mexico), Puyehue-Cordón Caulle (Chile), Sakura-jima (Japan), Santa María (Guatemala), Shiveluch (Russia). Posted by admin in activity reports, Africa, Batu Tara, Chile, Dukono, Eritrea, eruptions, Guatemala, Hawaii, Indonesia, Japan, Kamchatka, Karymsky, Kilauea, Kirishima, Kizimen, Kliuchevskoi, Lokon-Empung, Nabro, Philippines, Puyehue, Sakura-jima, Santa María, Shiveluch, Soputan, Taal, United States, Weekly Volcanic Activity Reports. The Smithsonian Institution/United States Geological Survey Weekly Volcanic Activity Report for 29 June – 5 July 2011 is now available on the Global Volcanism Program website. The following is a summary and not a substitute for the full report. New activity/unrest: Kirishima (Japan), Kliuchevskoi (Russia), Lokon-Empung (Indonesia), Nabro (Eritrea), Puyehue-Cordón Caulle (Chile), Soputan (Indonesia). Ongoing activity: Batu Tara (Indonesia), Dukono (Indonesia), Karymsky (Russia), Kilauea (Hawaii, USA), Kizimen (Russia), Sakura-jima (Indonesia), Santa María (Guatemala), Shiveluch (Russia), Taal (Philippines). Posted by admin in activity reports, Africa, Ambrym, Batu Tara, Chile, Eritrea, eruptions, Fuego, Guatemala, Hawaii, Indonesia, Kamchatka, Karymsky, Kilauea, Kirishima, Kizimen, Nabro, Pacific, Planchón-Peteroa, Russia, Sakura-jima, Shiveluch, United States, Vanuatu, Weekly Volcanic Activity Reports. The Smithsonian Institution/United States Geological Survey Weekly Volcanic Activity Report for 22-28 June 2011 is now available on the Global Volcanism Program website. The following is a summary and not a substitute for the full report. New activity/unrest: Ambrym (Vanuatu), Kirishima (Japan), Nabro (Eritrea), Puyehue-Cordón Caulle (Chile). Ongoing activity: Batu Tara (Indonesia), Fuego (Guatemala), Karymsky (Russia), Kilauea (Hawaii, USA), Kizimen (Russia), Planchón-Peteroa (Chile), Sakura-jima (Japan), Shiveluch (Russia). Posted by admin in activity reports, Africa, Batu Tara, Chile, Costa Rica, Egon, Eritrea, eruptions, Etna, Hawaii, Indonesia, Italy, Kamchatka, Karymsky, Kilauea, Nabro, Paluweh, Russia, Shiveluch, Turrialba, United States, Weekly Volcanic Activity Reports. The Smithsonian Institution/United States Geological Survey Weekly Volcanic Activity Report for 15-21 June 2011 is now available on the Global Volcanism Program website. The following is a summary and not a substitute for the full report. New activity/unrest: Etna (Italy), Nabro (Eritrea), Puyehue-Cordón Caulle (Chile), Turrialba (Costa Rica). Ongoing activity: Batu Tara (Indonesia), Egon (Indonesia), Karymsky (Russia), Kilauea (Hawaii, USA), Paluweh (Indonesia), Shiveluch (Russia). Posted by admin in activity reports, Africa, Aso, Batu Tara, Caribbean, Chile, Dieng Volcanic Complex, Eritrea, eruptions, Hawaii, Indonesia, Japan, Kamchatka, Karymsky, Kilauea, Kizimen, Mayon, Nabro, Pacific, Puyehue, Russia, Sakura-jima, Shiveluch, Soufrière Hills, Tengger Caldera, United States, Vanuatu, Weekly Volcanic Activity Reports, Yasur. The Smithsonian Institution/United States Geological Survey Weekly Volcanic Activity Report for 8-14 June 2011 is now available on the Global Volcanism Program website. The following is a summary and not a substitute for the full report. New activity/unrest: Aso (Japan), Dieng Volcanic Complex (Indonesia), Kizimen (Russia), Nabro (Eritrea), Puyehue-Cordón Caulle (Chile), Yasur (Vanuatu). Ongoing activity: Batu Tara (Indonesia), Karymsky (Russia), Kilauea (Hawaii, USA), Mayon (Philippines), Sakura-jima (Japan), Shiveluch (Russia), Soufrière Hills (Montserrat), Tengger Caldera (Indonesia).